Winter Park is an historic planned community built along a group of lakes in Central Florida. It is recognized as the first centrally planned community in Florida; its main street includes not only public civic buildings and retail, but also art galleries, a private liberal arts college, museums, a park, a train station, a golf course country club, cemetery, and a beach. Winter Park is celebrated for a sense of place and history - many U.S. Presidents used to visit here during the season. The Winter Park Sidewalk Arts Festival attracts 350,000 visitors from around the country. Rollins College, Full Sail University, and Valencia Community College make Winter Park a college town as well. 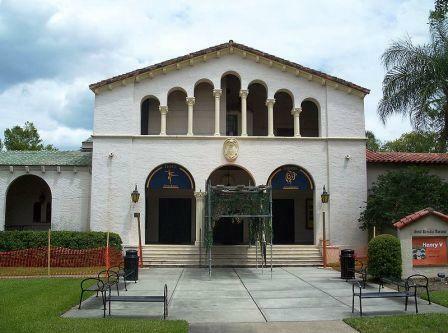 Picture of Russell Theatre at Rollins College courtesy of Wikipedia and Ebyabe. The early photo shows the Hotel Alabama, since converted into condominiums. There are many pretty streets and neighborhoods in town, or you can live in a development outside of town (see Active Communities link at left). Zillow reports the median home value was $408,100 in mid-2018. There are many neighborhoods where the median prices are in the $100's. 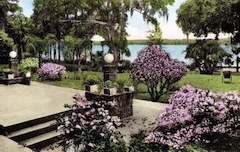 Winter Park was the first centrally planned community in Florida. The main street includes retail and public civic buildings, art galleries, a private liberal arts college (Rollins), museums, a park, a train station, a golf course country club, a historic cemetery, and a beach and boat launch. The Winter Park Sidewalk Arts Festival is one of the top juried art shows in the country. Winter Park has more park space per capita than any other city in Florida. There has been some discussion on various boards about Winter Park having some rundown areas, particularly in the Goldenrod and University areas. Others say that is probably associated with neighborhoods where students are renting. Winter Park is north of Orllando in an area of large lakes. The average July high is 92 and the average January low is 50. June is the wettest month with over 7" of rain. The Charles Hosmer Morse Museum of American Art houses the largest collection of Tiffany glass on Earth. The Winter Park Sidewalk Art Festival attracts 350,000 visitors a year, and it is just one of the cultural attractions of Winter Park, along with the Bach Festival and the Councours d'Elegance. Rollins College has cultural events as well. The City-Data.com Crime Index in Winter Park is 349, which is below the U.S. average of 394. Most crime appears to be of the non-violent type. Like any older town with a university area, there will be some run-down areas. Posters on various sites say Winter Park Village is a high crime area. There are a number of hospitals less than 10 miles away in Orlando. Winter Park enjoys an Amtrak station. Nearby Orlando Airport is one of the busiest in the nation. Wikipedia page for Winter Park.